Born in Figueres, Spain, Salvador Dalí was an artistically precocious child and eventually attended the Royal Academy of Fine Arts in Madrid – getting expelled twice. He believed he was more qualified than those who administered his examinations. He devoured the philosophical writings of Freud and he was deeply interested in cubism, futurism, and metaphysical art in magazines as a young artist. He had his first one-person shows in Barcelona in 1925 and in Madrid in 1926. His work eventually fused the pictorial concepts of the Surrealists, Juan Gris, Giorgio de Chirico, and Carlo Carra with the refined methods of the Old Masters. Sometime during 1926, Dali made a brief excursion to Paris where he met Picasso. 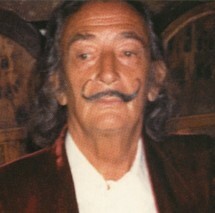 Initially, Dalí was shunned by the Surrealists for possessing too much skill and painterly technique, as the Surrealist ideal was based on a rejection of rationality. Later, Andre Breton, surrealism’s central proponent, appointed him an official Surrealist. Within a short time Dalí was to become the movement’s most spectacular advocate. In his art, he succeeded in achieving the synthesis of what Andre Breton called, “a retrograde craft with the most extreme inventions of modern culture.” His graphic oeuvre includes etchings, lithographs, and combinations of both which evolved parallel to his paintings. Throughout his career, Dalí’s fame and reputation grew dramatically as he developed a Surrealist persona to accompany his art. Stories of Dali’s bizarre and audacious behavior have become the stuff of legends of modern art history. As his fame grew, so did the demand for his work among collectors and museum curators who sought to acquire and exhibit his paintings, objects, and graphic works. In 1982, the Salvador Dalí Museum was opened in St. Petersburg, Florida, which was developed from the personal collection of Dalí‘s patrons, A. Reynolds and Eleanor R. Morse. In 1974, the Dalí Theatre-Museum (Teatro-Museo Dalí) was officially opened in Figueres, Spain after Dalí himself worked on its development since 1970. In the mid 1950s, Dalí met his most important friends and patrons, Drs. Guiseppe and Mara Albaretto. Their friendship, which lasted until Dalí’s death in 1989, produced the largest private collection of Dalí original works in the world. The Albarettos also became important publishers of etchings and lithographs by Dalí including the “Sacra Biblia (Sacred Bible)” portfolio, the “1001 Arabian Nights” series, the “Odyssey” of Homer, and numerous individual images. These works, due to their impeccable provenance, remain some of the most desirable graphic works ever created by Dalí. The Albarettos also acquired an earlier publisher of Dalí works “Les Heures Claires,” publisher of the “Divine Comedy,” comprising 101 wood engravings illustrating the epic poem of Dante. The poem recounts the tale of the poet’s journey through Hell, Purgatory, and Heaven, guided by Virgil. After repenting, he is joined by Beatrice for the rest of his journey through Paradise to receive a glimpse of God. Dalí often equated Gala, his wife and inspiration, with Dante’s Beatrice. Like Dalí, Dante’s symbolism is complex but highly intentional and rational. Both men had a keen knowledge of scientific studies in geology, optics, and mathematics. Dalí’s Divine Comedy is considered one of the artist’s most important creations of his prime years. Several tragic occurrences plagued Dalí in his last years. In 1980, he was forced to retire due to his palsy, causing uncontrollable tremors. In 1982, his wife Gala died, plunging him into a deep depression. To make things worse, in 1984, he was severely burned from a fire in his bedroom. He finally died in January of 1989 where he was living as a recluse in a tower of his own museum. To learn more about the Salvador Dalí Collection at Park West Gallery, please visit http://dali.parkwestgallery.com.